Joe Dumars noticed the size first. Then he thought about the potential. The second pick of a loaded 2003 NBA draft had fallen into his lap. With a championship-caliber roster already in place, that coveted pick was the remnant of an ancient, one-sided trade with the Grizzlies.1 Dumars and the Detroit Pistons tapped Darko Milicic, a Serbian big man whose upside seemingly had upside, over future perennial All-Stars Carmelo Anthony, Chris Bosh, and Dwyane Wade. A few experts even expected Milicic, just 18 at the time of the draft, to one day take the league with a unique blend of strength and finesse. He was a 7-footer who could dribble and shoot, as comfortable two feet away from the basket as he was 20. But choosing a big man in the NBA is always a precarious endeavor, largely based on projection and hope. Centers routinely enter the NBA with the rawest, least developed skills of any position. As amateurs, they dominate simply by towering over their opponents. But in the NBA, they can be just another tree in the forest. Historically, size wins when teams debate between smaller, more agile players and bigger ones with potential. That’s why Sam Bowie went before Michael Jordan and Greg Oden was taken before Kevin Durant. Sometimes you get Shaquille O’Neal. Sometimes Michael Olowokandi. “When you get a special talent like this, and it comes at that size, it’s almost impossible to pass on that,” Dumars, Detroit’s president of basketball operations, told reporters upon drafting Milicic. “As special as I think Carmelo Anthony is, I do believe there will be other great 6-8 small forwards who will come around. But when the opportunity comes to get a 7-1 player with that kind of ability, you don’t pass it up.” Dumars did not. But the red flags came early for Milicic. When he relayed his idea of wearing a suit to the draft and then ripping if off — Superman-style — upon his name being announced, revealing a Pistons jersey, Dumars wisely cautioned against it. It was then that the doubts began to creep into Dumars’s head. Milicic would become an NBA wanderer, never reaching his potential. Now, with Anthony, Wade, and Bosh still thriving in the league, Milicic is out of it. Just as Milicic was drafted by Detroit, Christine Cameron watched her son Andre get introduced to the game of basketball. It was only natural — Drummond was big. He had always been big; so large, in fact, that his uncle Phil Santavenere prophesied at Andre’s birth that he would one day play in the NBA. But he had a long way to go. During a game when Drummond was 7 years old, all the players ran to the action on one side of the court. Drummond jogged in the opposite direction. “He didn’t even know which end of the court to run to,” Cameron said. “I used to say it was like comedy hour every Saturday when we’d go to watch him play.” Other parents complained whenever the gangly kid entered the game. Once, Santavenere sat in the stands near a couple. “He stinks,” Santavenere recalled the couple saying as they pointed and laughed. “Look at how big and uncoordinated he is.” Drummond’s uncle fumed. But he also knew something that couple didn’t. “People didn’t realize his potential,” Santavenere said. And as Cameron, Santavenere, and others helped Drummond navigate the murky, territorial waters of youth basketball, the doubters grew louder and more forceful. Right until the moment he quieted them for good. At first Drummond was all knees and elbows. Santavenere had a corner in his home where he marked off the height of the boys every few months. His nephew soon shot past Phil Jr., two years his elder. Santavenere eventually had to stand on a chair to mark Drummond’s height. But Drummond could barely make a layup. Surrounded by smaller players, he emulated them by hauling in rebounds and attempting to push the ball upcourt, before inevitably turning it over. But he kept pace with the fleetest of players and had big, reliable hands. “My uncle Phil really just helped me continue to get better and show me different things that I could do because he knew that I was going to be big, so he always tried to work with me on my back to the basket and my post game,” Drummond said. Santavenere also wanted the boys to know how far they had to go if they wanted to excel. He pitted them against the tougher, older teams from Philadelphia, New York, and New Jersey. They piled into Santavenere’s Toyota Sequoia, sometimes eight or nine members of the team, and scraped together enough money for one hotel room; everyone who couldn’t fit in the room slept in the car. When a youth league held a draft for incoming players, every team passed on Drummond, until Santavenere took him with the last pick of the first round. “They might as well have just handed us a couple more chips, because it was just unfair,” Santavenere said. “They just saw a goofy, nice kid that was uncoordinated and long.” Soon, Drummond began to improve. By 12, he towered over opponents and had become a willing student of the game. Drummond and his two cousins joined Hargreaves’s team. Cameron, meanwhile, told her son that he could be anything he wanted: a doctor, a lawyer, even a pro basketball player. The product of a strict household in St. Thomas, Cameron immigrated to the United States in 1989 and had Andre four years later. Drummond’s father was never around growing up, but Cameron, a nurse at Middlesex Hospital, was tough with her son and expected respect. Once, Santavenere recalled, he arrived at their home to pick up Drummond for a basketball camp hosted by LeBron James. But Drummond had forgotten to do the laundry that day. Not good: Cameron grounded her son. Drummond had one game in which he recorded an eye-popping quadruple-double: 27 points, 14 blocks, 16 rebounds, and 10 steals. “I knew at that point that he could go far in this basketball thing,” Gillespie said. He also kept growing. One day, Drummond found himself bickering with a teammate. “If you weren’t 6-10, you’d be nothing,” the kid said to him. Drummond paused and considered his response. “Well, I am,” he replied. Christopher Fulton, a teacher and coach, overheard the conversation. He’s right, Fulton said he remembered thinking. You can’t teach height. You can’t teach size. You can’t teach speed. The 2004 Pistons captured a championship, but Darko Milicic was little more than a footnote. Dumars had masterfully dealt for Rasheed Wallace that season, a deal that vaulted the Pistons and also buried Milicic further on the depth chart. It was a poor fit for both parties. The Pistons were loaded enough to take a big swing on a project like Milicic at the time, but they whiffed. He averaged fewer than two points in 96 regular-season games with Detroit. As time wore on, everyone — Dumars included — regarded the selection as the worst of his Pistons tenure. But deep down, Dumars may still wonder about gambling on Darko, a player who, had he reached his potential, could have transformed his Pistons in ways that Carmelo Anthony and Chris Bosh couldn’t. Dumars had wagered on the wrong guy, filing the moment away and vowing to learn from it. As the championship core began to age, the Milicic choice wiped out any chance at continuity for Detroit’s success. The free-agent signings of Ben Gordon and Charlie Villanueva in 2009 proved disastrous. The Pistons regressed after qualifying for the Eastern Conference finals in six straight seasons, and began to cycle through coaches every couple of years. “I could give a dissertation on that,” Dumars eventually told MLive.com of the choice to select Milicic. “After I drafted Darko, from that point on, the amount of background we do on every single player that you see us draft is ridiculous. We do as much or more background than any other team in the NBA because of that. Drummond quickly took to St. Thomas More. He became a resident adviser for the school’s eighth and ninth graders and helped coach the junior varsity basketball team. He was beginning to fit in. The plan unfolded just as Quinn envisioned. St. Thomas More won a National Prep Championship in 2011. Drummond averaged 15 points and 11 rebounds. Gatorade named him the state’s high school player of the year. But there were questions from pundits about Drummond’s work ethic. Santavenere and Hargreaves also had a falling-out. The split left Drummond torn. The two men had served as mentors in both life and basketball, filling the male presence left by his absent father. Santavenere believed Hargreaves was positioning himself to profit from Drummond’s imminent professional career. In an e-mail, Hargreaves denied the accusation. But there was a moment when her son tried to alter the plan. Word spread that Drummond was prepared to join a third school in four years, on Hargreaves’s recommendation. After graduating from St. Thomas More in 2011, Drummond announced that he planned to attend Wilbraham & Monson Academy, a prep school in Massachusetts, rather than college. Drummond’s sister, Ariana, and Kris Dunn, an AAU teammate, also planned to attend. Drummond liked the idea of being around family, and the transfer would also hide him for another year, allowing him more time to develop his game against weaker competition than the college level. Drummond would then be draft-eligible, a largely unknown commodity with a high ceiling. Drummond resisted. He wanted to be with his sister as she entered high school. He wanted to play with Dunn. Drummond would be hiding if he went to another prep school, Santavenere said. Yes, the transfer could boost his draft stock. But that would go against everything Santavenere and Cameron had taught him. Remember when he cried when Santavenere kept him on the bench? Remember when Santavenere laid him out in the games in the backyard? You earn what you get. 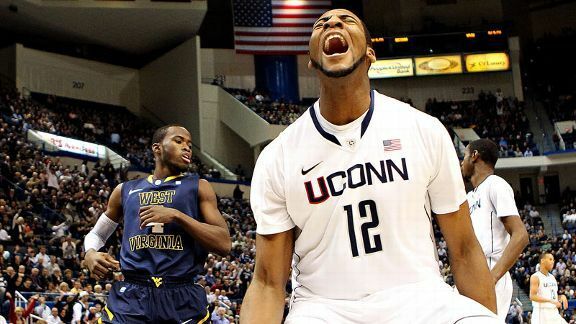 On August 26, 2011, Drummond tweeted that he was headed to UConn. “I wanted to go back to high school, but I think it was best for me to just move on and go to college and just play against the top talent at the college level instead of going back to high school and just plateauing,” Drummond said. The news caught everyone by surprise. 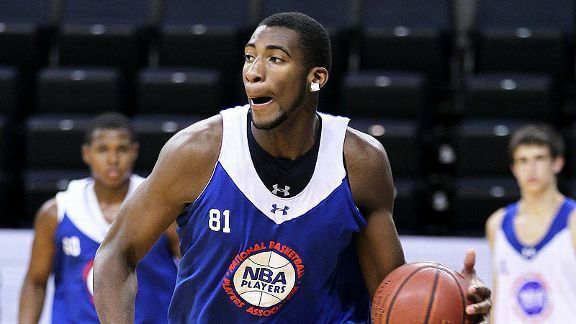 Drummond had to reclassify again to join Connecticut’s incoming class. Drummond hoped to guide Connecticut to a repeat national championship. Guard Jeremy Lamb hadn’t heard much about the touted recruit, but marveled when Drummond arrived on campus. “He could do whatever dunk he wanted,” Lamb said. Calhoun had heard all the disclaimers about players before their arrival in Storrs: that Caron Butler was a troublemaker. That Ben Gordon was too small to score. That Rudy Gay couldn’t get his own shot on the next level. They all proved their naysayers wrong. He expected Drummond to do the same. Still, Drummond and the university hit one roadblock after another. He decided to attend the school just three days before the start of the fall semester. UConn possessed only 10 scholarships after losing one due to NCAA violations and two because of a poor academic performance rating. UConn faced a postseason ban the following season due to several years of low scores on the NCAA’s Academic Progress Rate. The family convened again. Drummond decided to declare for the NBA draft, becoming the first one-and-done player in Connecticut’s storied history. “I wanted to stay, but I think the best move for me and my family was to continue on,” Drummond said. Few knew how harshly NBA scouts would judge Drummond for his lone season as a Huskie. The calls left Jere Quinn flabbergasted. A number of NBA organizations called with the same questions before the draft. Did Drummond play hard? Was he too nice? Did he love the game? Quinn responded with his own set of inquiries: Who is the biggest guy in the draft? Who is the youngest guy in the draft? Who is the most athletic guy in the draft? “Well, if I’m in a position to get the biggest kid in the draft, the best athlete, who’s the youngest, I’m going to covet that,” Quinn would say. Questions about his “motor” and “desire” continued to follow him. According to those close to Drummond, there are several possibilities for the rumors’ origins. Maybe it was because he smiled when he played, rather than scowled. Or maybe it was the AAU teams Drummond chose not to play for that floated the rumors out of jealousy. Or maybe Drummond knows the real reason. Dumars had dreams of a new front line. He imagined a dynamic pairing with Greg Monroe, a talented forward he’d drafted out of Georgetown in 2010. At the NBA draft combine in Chicago, Drummond tipped the scales as the heaviest prospect, at 278.6 pounds. But he was also one of the leanest, with just 7.5 percent body fat. And after he eliminated cookies from his diet, Drummond trimmed 14 pounds from his 6-foot-11 frame. He was a man-child; a rare combination of size and athleticism, maybe the NBA’s greatest mix of the two since Dwight Howard. Those eight teams still needed to pass on Drummond. Cleveland at four, Sacramento at five, and Toronto at eight all could have used an imposing big man. 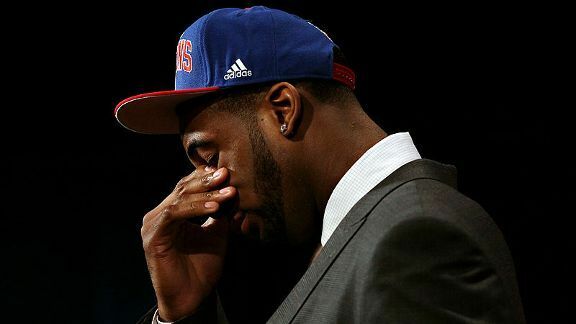 During the draft, cameras panned to an anxious Drummond as each of those teams passed him up. Cleveland took Dion Waiters, Sacramento selected Thomas Robinson, who has been traded twice, and Toronto drafted Terrence Ross. Detroit eagerly grabbed Drummond, who couldn’t have been more relieved. “I knew I was getting picked here, so I was really excited knowing I had a home and a place that really wanted me,” Drummond said. “They knew that they were going to get a player that was going to work hard.” The Darko comparisons inevitably followed. The Pistons vowed to introduce Drummond to the NBA slowly and carefully. They wanted him to be an athlete, a shot blocker, a presence, a finisher. Now a perennial lottery team, Detroit’s organization had more than enough time to develop Drummond. It had learned from its mistakes with Milicic. “We kept it very simple and allowed him to grow at his own pace,” said Dumars, “because we felt like the worst thing you can do is put undue expectations on this kid.” Drummond looked promising in limited minutes. Soon he was compiling highlight-reel plays at both ends of the court, flexing that freakish length and revisiting the days when he imagined himself as a rangy guard. But it wasn’t enough for him. The organization is enthralled with Drummond — it almost cannot believe its luck. Before talking basketball, Dumars and others in the organization talk about him as a person. The big kid with the broad, beaming smile is grounded and respectful, according to several members of the organization. Those questions about desire? They’re gone. Most young players would jump at their first chance at independence. Drummond wanted to live with his mom and sister in Michigan. His mom has lived with him since day one. Ariana eventually came around — she attends Detroit Country Day School, the same high school that produced Shane Battier and Chris Webber. At the behest of owner Tom Gores, Dumars remodeled the Pistons this offseason. Maurice Cheeks replaced Lawrence Frank as head coach. The organization added Josh Smith, Brandon Jennings, Italian star Luigi Datome, and is bringing back the steady veteran Chauncey Billups. Smith, Monroe, and Drummond should comprise a formidable frontcourt. Drummond has already impressed Cheeks in their short time together. He described Drummond’s hands as the best of any big he has seen. And he’s encouraged that the young big man seeks him out. Pistons fans expect their team to make the playoffs for the first time since their championship and string of conference finals appearances. But much of that hinges on Drummond’s growth. Wallace is teaching Drummond to be more vocal on the court this season. And this year, Drummond and Cameron are living apart — but not far enough that Drummond can’t stop by for a home-cooked meal. Boornazian is still awaiting Cosgrove’s response. Drummond and McCurdy say that their relationship won’t affect their jobs, to the great relief of Pistons and Nickelodeon fans everywhere. (Rumors have been floated about a possible breakup, though neither party has confirmed.) Drummond’s route — with the help of his family — wasn’t always traditional. But few can argue with the results. If Darko Milicic went out of his way to date a Nickelodeon actress, you might have wondered about his priorities. When Drummond did it, everyone laughed. The Pistons are happy and getting better. So is Drummond. The Grizzlies traded this conditional pick to the Pistons for Otis Thorpe in 1997. A tortured Jerry West, then Memphis’s general manager, looked on as the pick went to Detroit at the draft lottery. Memphis would only have retained the pick had it been the first overall, which would have allowed Memphis to draft LeBron James. Drummond welcomed the news. He often played pickup basketball at the YMCA with his friend, Mike Boornazian. Drummond often messed around, shooting fadeaways and drawing Boornazian’s frustration on the rare occasion they lost. Boornazian shook his head when the bigger Drummond insisted that Boornazian be the screen setter. “He swears to this day that he’s a guard,” Boornazian laughed.